The book shows the way that Greatness exists in all of us. It's simply a matter of nurturing that greatness. The book helps to build self-confidence and strength to achieve your goals. You Are Unique draws an unforgettable blue print of success and hope for all. This book represents the balance of head and heart. The thoughts of Dr Kalam are presented in a very simple heart felt communicative way, some selected poems are presented artistically with paintings to leave a deep impression on the minds of the readers. This new genre book has a unique design with thoughts giving direction to an integrated, complete and successful life and the artistically presented poems with paintings touching the heart. The book shows how to achieve individual as well as organizational excellence and creative leadership. 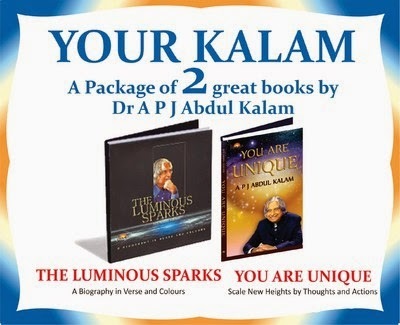 The Luminous Sparks a Biography in Verse and Colours is written by 11th President of India Dr A P J Abdul Kalam. The book has won PRIZES FOR EXCELLENCE IN BOOK PRODUCTION AND ITS JACKET. It is a unique collection of poems and biographical notes. This is a new genre book in which great thoughts are presented with matching paintings specially done for these poems by seven well-known painters from different parts of India. The Luminous Sparks is printed as a Deluxe Edition on art paper. It covers the entire panorama of Dr Kalam's thoughts about life and work. Publisher: Punya Publishing Pvt. Ltd.